My coworker uses a glue stick on his glass bed. Hair spray is another popular approach. We use [wide] blue tape on our MakerBots. But they have automatic bed leveling. If the build is too large and too thick, as the model cools you get a lot of torque on the model and often a corner will pull off the build plate. The build will look OK, but be distorted. I’d definitely enclose the build chamber to improve process control. Should you cool the chamber to increase heat dissipation to prevent this? This morning I caved and ordered 5 more kg of filament, some better couplers, and a raspberry pi to replace the one I stole from my step-daughter. $7 for a Sony Playstation USB camera that supposedly works very well. Octopi is the shiznitz. I'd like to enclose the printer. I want to put it in the basement. Right now it's on the dining room table and that has proven... unpopular. Basement is both not temperature controlled and a much more dusty environment. Seems there is no need to cool (or heat) the chamber. Just enclose to keep the environment a bit more consistent. Looks like the popular approach to an enclosure is the Ikea Lack end-tables; 2x, stacked, 3d printed connecting hardware, plexi fitted between. @ $15/ea + $9 shipping. I'm not sure I can build plywood shelves for less than that. Does your printer have a Bowden or direct extruder? Bowden. It's a Creality Ender 3. The newer 'pro' version with the extruded Y-axis support. I've been using the sample filament they included (some basic cheap white PLA) to print a bunch of cable management and misc 'upgrades' to the printer. One was a filament guide for the extruder. Design has the filament entering very, very close to the z-axis drive screw. I printed the guide and installed it.. and had problems on the very next print. Caused the extruder to skip and fail to retract correctly. I think this thing is the Harbor Freight of 3D printers. Perfectly adequate for jabloneys like me. But requires some attention out of the box. Which is fine. I actually have it making somewhat reliable prints now. Dope. That's a good setup! I would think not. Stratasys build chamber for ABS is maintained at 80° C / 175° F.
The white is the last of the sample PLA that came with the machine. The inserts for this are 100% infill and still the sample was going and going and going. Finally I found it got unusable with less than 1m left and threw the rest out. Was supposed to use PTEG or something tougher for the insert.. but didn't. We'll see how it works out. Huh. Those look like ER16 collets. And just like that, I can't get ANYTHING to stick to the bed anymore. Bed has had a concave shape since I pulled it out of the box. The center is lower than the corners. I had it working with the nozzle too low at the edges but marginal in the middle. Now nothing will stick at the middle of the print bed. I think I'm about to throw out the magnetic bed, head to home-despot and get a bit of glass. I used to revive Stratasys uPrint trays by 'roughing' them up with medium grit sandpaper. One or 2 swipes at 45 degrees to the tray in each direction. With use the tray gets too 'smooth'. Last night I resorted to glue sticks. That worked. Finally got another print out of this thing. Unfortunately it was an intricate part and I resorted to a brim. Cleaning the brim off is a nightmare. So.. meh. I also now have 5 layers of aluminum foil under the magnetic mat in an attempt to take the concave out of it. Going to hit HD first chance I get. Seems it's popular to use a glass mirror that HD sells in 6 packs. Maybe try this also once you have glass. Our caveat was always that saving $5 by reusing a build tray was not worth it if you lost a $200 build. I have a uPrint Plus in the garage. Great machine. What part of a build is $200? Media for these things is pretty reasonable. Or was that a time = money thing? Just get one, you wont regret it. Most hobby printers print one or two thin surface shells and very low infill. “Infill” (it’s not called that) for commercial parts is 70-95%. They are accurate to a few thousandths, the weakest material used is ABS, and are typically much larger and use much more material, made on $15,000+ machines. Those machines will run reliably for days-long builds. Our record was a build that took eight days. We printed a full-size BMW frame in pieces and bonded them together. The material alone was probably over $1,000. I don’t remember. We could print 16” x14”x16”. 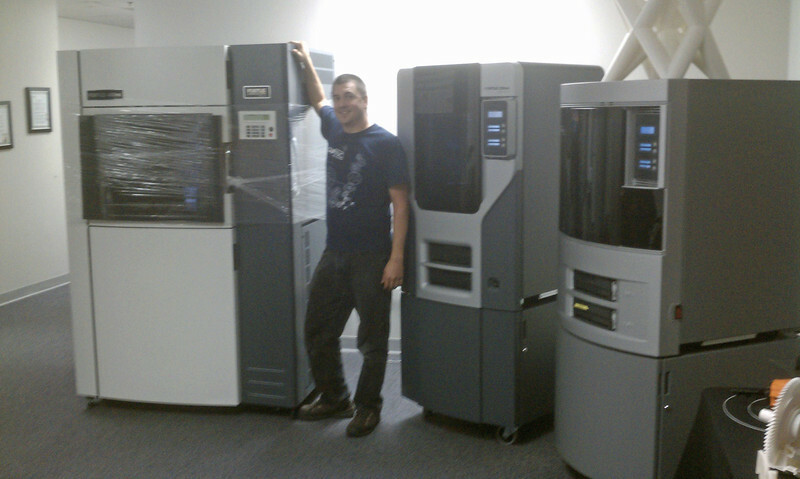 This is roughly $200,000 worth of printers. Last edited by Garandman; 01-06-19 at 07:42 PM. It's really weird when I come back to a post and find G-man has edited it substantially. Anyway. For us mere hobbyists..
My machine earned part of its way last night. I have an old 8" Craftsman table saw that was my grandfathers. This saw has a 1/2" arbor. Nobody really makes blades for that size anymore. Everything is 10" with a 5/8" arbor. Some blades come with a little adapter shim. I have one for the blade I have in the machine but forgot it was on there when I took the blade off to try the dado stack the other day. After hours of sifting through piles of sawdust with a magnet I gave up. After 15 minutes with tinkercad and an 8 minute print I had a small collection of arbor adapters. They don't take any force from the blade. They just center it so you can tighten it in the holding mechanism straight. Worked slick. I'm going to print a few more in the ~3/4" range to try in my dado stack. 8 hour print left to run overnight. Looks like it went off the rails pretty early. Also having some warping on large flat prints. I need to build a chamber for this thing. Running it in my cold-ish basement is not doing it any favors. It happens. This wasn't me, but was the result of a failed print that I got to help clean up. These were me, trying to figure out what was going to work and what wasn't. Seems like I finally have it working on one of the printers that I was trying on. Heated bed, yes. Run it at 60-C. That works well in most cases. I occasionally see warping. This is really the first time I've had a print fail this dramatically. I have had a lot of problems with bed adhesion. I normally monitor the print for the first layer or so, often dialed back to ~80% print speed. Once the first layer is down I often crank the print speed to ~125% and let'er rip. Although I left this print running at 100%. I turned out most of the parts for this print this weekend with few issues. As I say, just some minor warping around the edges of the really large parts. As I've said, the bed on this ender is crap and has some hefty dish to it. That makes large flat prints hard to pull off anyway. I figure the drafty basement isn't doing me any favors. I was impressed that I was able to print the knobs which have some decent overhang without any issues. If anyone needs real-world strength motorcycle parts, pm me with your email. I’ll run them on the uPrint Plus in ABS for the cost of materials. If you need some design help I may be able to create the model in SolidWorks. Love the great community here!!! Page generated in 0.167 seconds with 18 queries.